Read a novel, then see the movie and you’re often disappointed. It’s difficult for a motion picture to recreate a detailed, nuanced book filled with subplots and many characters and do justice to the original story. This has been true perhaps since the advent of motion pictures. 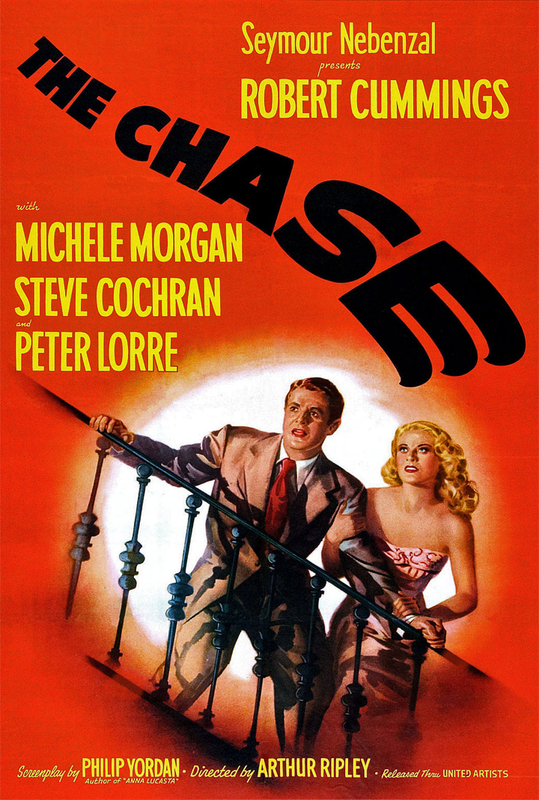 Case in point: the 1946 production of The Chase, based on the novel, The Black Path of Fear, by Cornell Woolrich. In this space I recently reviewed the Woolrich suspense novel, a story of lost love and of desperation in the dark alleys of post-World War II Havana. Many of the author’s novels and short stories became radio, TV or motion picture dramas and I looked to see if the film version of Black Path, called The Chase, was available on Netflix. No luck; probably one of those “B” crime movies that have faded away as the celluloid deteriorated. Not so. Checking the cast on imdb.com, I noticed a link to the Internet Archive. That site had a copy of the movie that could be streamed, so I let it play. It’s difficult to discuss details of the plot without spoiling either the book or the movie. Things that take place in the middle of the book, via a flashback, form the first scenes of the movie. And an event in the middle of the movie, happens in the first few pages of the book. Without getting into too many specifics, Chuck Scott, played by Bob Cummings, is an honest, destitute vet who finds a wallet on a Miami street and returns it to its owner, Eddie Roman, played by Steve Cochran. It’s obvious that Roman is a ruthless, wealthy hood. The first evidence of this is a scene when he knocks his manicurist to the floor when she displeases him. The second bit of evidence is that his assistant, aka henchman, is played by Peter Lorre. Admiring, while mocking Scott’s honesty, Roman gives him a job as his chauffer. Later, after an unnecessary scene designed to remind viewers—if they had fallen asleep in the previous five minutes—that Roman was really a nasty guy, Scott meets the glamorous Mrs. Lorna Roman (Michele Morgan). The majority of the book and a relatively small portion of the movie take place in dingy alleys and flop houses in Havana. The noirish movie does a fairly good job reproducing the book’s skid-row atmosphere, with some dialog sounding as if it were taken directly from the novel. But this part of the film story is about as close as it gets to the book. New scenes and new characters are added and the film makes abrupt, substantial and sometimes laughable changes in the storyline. For example, in the book Roman urges Scott, as his chauffer, to drive fast. In the movie, Roman doesn’t need to tell him to speed up. He has an auxiliary accelerator and speedometer in the back seat. To speed up, Roman floors it and tells Scott to steer carefully as they exceed 100 mph in a clichéd race with a locomotive to a railroad crossing. Critics, including Woolrich biographer Francis Nevins, Jr., criticized screen writer Philip Yordan and director Arthur Ripley for twisting Woolrich’s story, ultimately changing the character and meaning of the novel’s original “chase.” Roman, a relatively minor character in the book, is on screen too long and Cochran’s mobster portrayal is over the top. Woolrich’s story is about a hapless guy on the run. Yordan’s story is partly about a harassed gangster and partly about a guy who falls for a mobster’s wife. In spite of numerous missteps in the script, Cummings comes across as a vulnerable everyman, as Woolrich portrayed him, and keeps the movie alive. The actor had recently starred in Alfred Hitchcock’s Saboteur, and eight years later would become a protagonist in the Hitchcock classic, Dial M for Murder. Lorre’s smarmy presence, of course, is a highlight of the film. In some scenes he seems a bit bored, but that was perhaps part of his character. Or this perception could be the fault of the grainy, scratchy print with occasional sprocket noise. The film is also available on DVD from Amazon but based on some of the online reviews, the DVD quality is no better than what’s available on the web stream. Driven by a music score that rises and falls melodramatically—to almost humorous proportions at times—The Chase veers from campy gangster fare to classic film noir and back again several times. If you see the movie before you read the book, it’s worth watching—and it’s so removed from the novel’s plot that the things you learn will not materially spoil the novel.